Above: A publicity portrait of Lane Bradford as the renegade Indian Tosco in the serial Man with the Steel Whip (Republic, 1954). 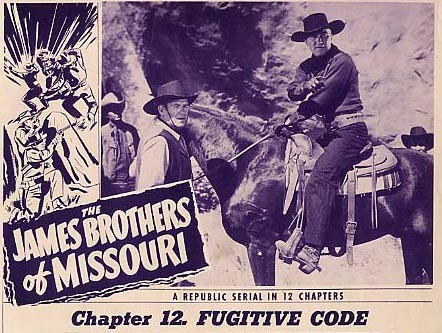 By the end of World War 2, as many of the principal serial and B-western “action heavies” (Edmund Cobb, Charles King, Bud Osborne) were beginning to age into more sympathetic roles, a new generation of henchmen emerged, actors who would later carry their villainy over into the new realm of television. This class of heavies included such notables as John Cason, John Crawford, and Zon Murray, but its most sinister graduate was Lane Bradford, whose cold stare, menacing voice, and tiger-like stride made him stand out in matinee and television fare alike. Lane Bradford was born John Myrtland LeVarre Jr. in Yonkers, New York. His father relocated to the West Coast in the early 1930s to pursue an acting career, bringing his family with him and taking the stage name of John Merton. Merton soon found a niche as a B-western and serial heavy, and his son not unnaturally followed in his footsteps when he grew up. Young LeVarre began taking bit roles in B-films in 1940, starting with a bit part in PRC’s Frontier Crusader, which featured his father in a principal role. The future Bradford may or may not have made his first serial appearance as an “extra” heavy in the Columbia chapterplay White Eagle (which featured his father as one of the major heavies); this author has not been able to pick him out of the serial’s crowd scenes, but that doesn’t mean he wasn’t in one of them; the (often inaccurate) Internet Movie Database claims so, anyway. In any case, Bradford continued a bit player and occasional stuntman throughout the early 1940s, taking both villainous and non-villainous roles and never receiving screen credit. He did definitely pop up in one serial during this time—Columbia’s 1942 outing The Valley of Vanishing Men, which gave him a small henchman part. 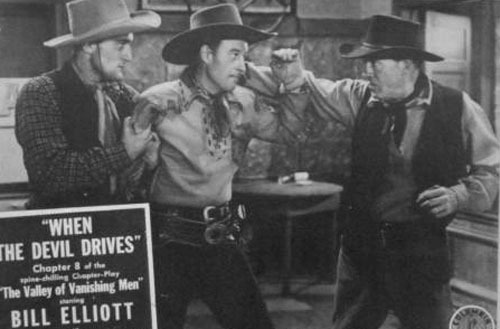 Above: Tom London (far right) and Lane Bradford fight Bill Elliott in The Valley of Vanishing Men (Columbia, 1942). Note that Bradford does not yet have the broken nose that he displayed in all his later parts; one wonders if it sustained this damage during his time in the military (see below). Bradford’s career was interrupted by military service in 1943; he reappeared in Hollywood in 1946 and finally began receiving bigger roles, taking his first credited part (a henchman, naturally) in the Monogram B-western Silver Range. 1947 found him playing opposite his father again, taking an uncredited but noticeable background role as one of villain Charles Middleton’s lab technicians (Lesseps by name) in Columbia’s rather lackluster cliffhanger Jack Armstrong. He featured briefly in a better Columbia serial that year, The Vigilante, playing a car thief named Andy who was busted—along with his cohorts—by masked hero Ralph Byrd in the first chapter. 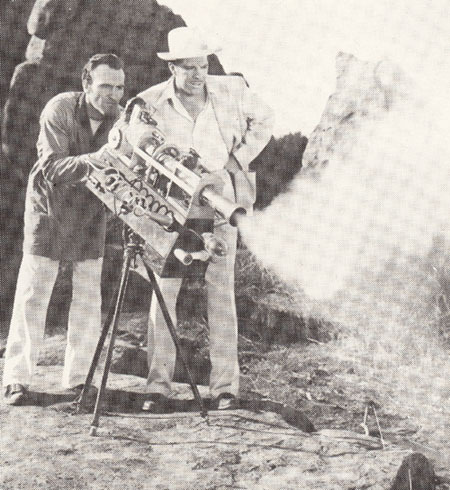 Above: Lane Bradford demonsrates a ray machine for Hugh Prosser in Jack Armstrong (Columbia, 1947). 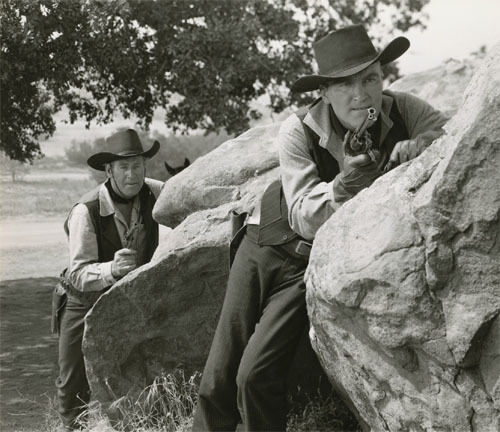 1947 was also the year Bradford began playing henchmen in several of PRC’s Eddie Dean and Lash LaRue B-westerns (Ghost Town Renegades, Check Your Guns, and others); his roles in these films tended to be larger than those he had received hitherto, and helped him to begin cementing his heavy status. In 1948, he played Bill, a recurring henchman of lead heavy George J. Lewis in Republic Pictures’ serial Adventures of Frank and Jesse James, but only appeared in four episodes total. 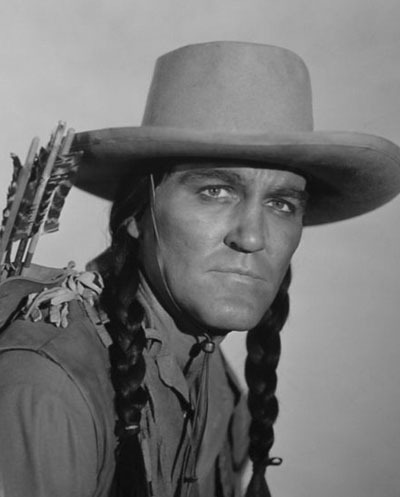 His B-western roles continued to grow in prominence during 1948, however, and in 1949 he took his first big serial part in Republic’s enjoyable follow-up to Frank and Jesse James, The James Brothers of Missouri. Cast as an outlaw named Monk Tucker, Bradford abetted leading villains Roy Barcroft and Patricia Knox in their fight against a freight line protected by the reformed James brothers (Keith Richards and Robert Bice). Bradford, as Barcroft’s accessory in active evildoing for most of the serial, avoided being overshadowed by the more experienced heavy, and firmly established himself as an above-average screen henchman. Above: Lane Bradford surreptitiously prepares to stampede a horse and catapult off-camera hero Keith Richards into a hangman’s noose in The James Brothers of Missouri (Republic, 1949). Above: Roy Barcroft and the mounted Lane Bradford prepare for the final shootout with The James Brothers of Missouri. 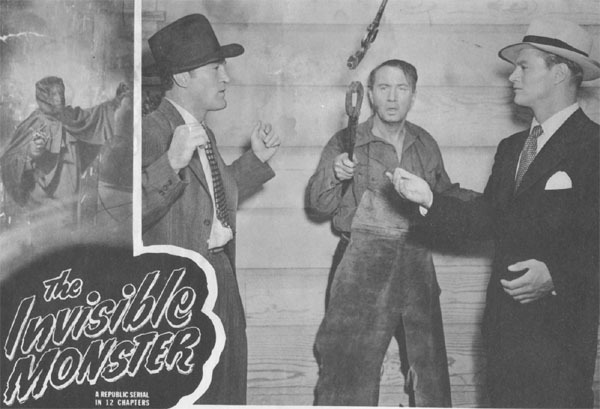 The enjoyable but implausible The Invisible Monster (Republic, 1950), took Bradford out of his familiar Western milieu but promoted him to the lead henchman role. As the gangster Burton, Bradford carried out the orders of evil scientist Stanley Price, who planned to seize power in the US by creating an invisible army. Bradford and his assistant John Crawford perpetrated multiple robberies to finance the scheme, but were continually thwarted by insurance detective Richard Webb. Bradford brought an icy coolness to even his most roughneck behavior, lending an added degree of menace to the villains’ side which helped to offset the manifest impracticality of Price’s master plan. Above: Lane Bradford prepares to clobber security guard Dave Sharpe in The Invisible Monster (Republic, 1950). 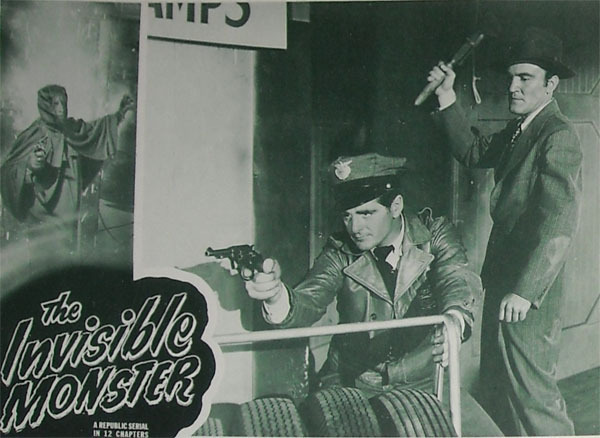 Above: Eddie Parker disarms Richard Webb as Lane Bradford watches in The Invisible Monster. 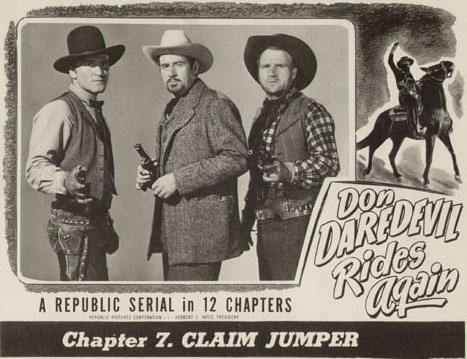 Above, from left to right: Lane Bradford, Roy Barcroft, and John Cason in a lobby card for Don Daredevil Rides Again (Republic, 1951). 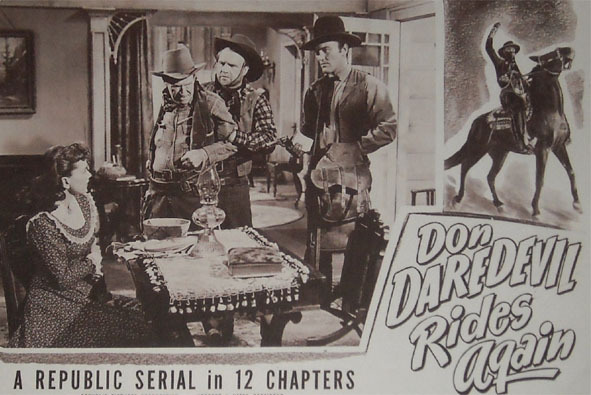 Above: John Cason and Lane Bradford threaten Hank Patterson and Aline Towne in Don Daredevil Rides Again. Zombies of the Stratosphere (Republic, 1952) gave Bradford his only head villain role in a serial. He played a Martian named Marex, who arrived on Earth with a plan to blow the planet out of its orbit with a hydrogen bomb so Mars could take its place; his plans were aided by a gang of renegade Earthlings but opposed by Larry Martin (Judd Holdren), a scientist with a flying rocket suit. Zombies relied heavily on stock footage from previous Republic productions, but worked well enough on its own. Bradford, though far removed from his usual outlaw roles, was excellent as Marex, using his typically cold voice and bearing to accentuate the character’s otherworldliness. Above: Leonard Nimoy and Lane Bradford in Zombies of the Stratosphere (Republic, 1952). 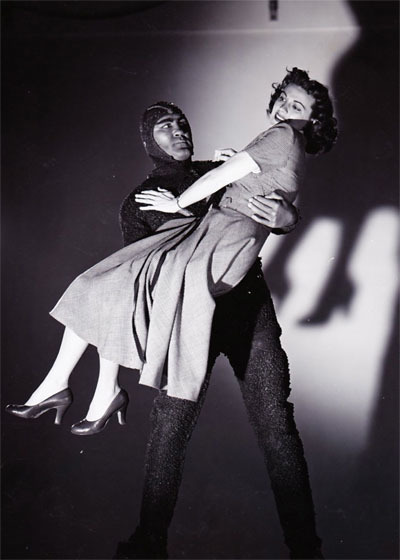 Above: Lane Bradford and Aline Towne in a publicity still for Zombies of the Stratosphere. 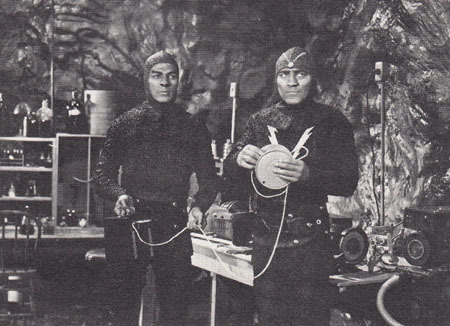 Bradford made his first ventures into television around the time of Zombies of the Stratosphere’s release, and would spend much of the following year appearing as heavies on the Roy Rogers Show, Sky King, Hopalong Cassidy, and other series, while also keeping up his feature appearances; he made his final serial, Man with the Steel Whip, in 1954. One of Republic’s last chapterplays, Steel Whip dealt with the attempts of a frontier profiteer (Mauritz Hugo) to run a tribe of Indians off their reservation so he could claim the gold-rich reservation land; Hugo was opposed by hero Richard Simmons, who posed as a come-to-life Indian legend. Bradford played Tosco, Hugo’s renegade Indian henchman, who perpetrated various acts of villainy in order to stir up local sentiment against his peaceful fellow-tribesmen. Bradford played second fiddle to lead henchman Dale Van Sickel in this cliffhanger, but still participated in most of the serial’s active villainy, playing his role with an appropriate mixture of stoicism and ferocity and affecting a believable Indian accent to boot. 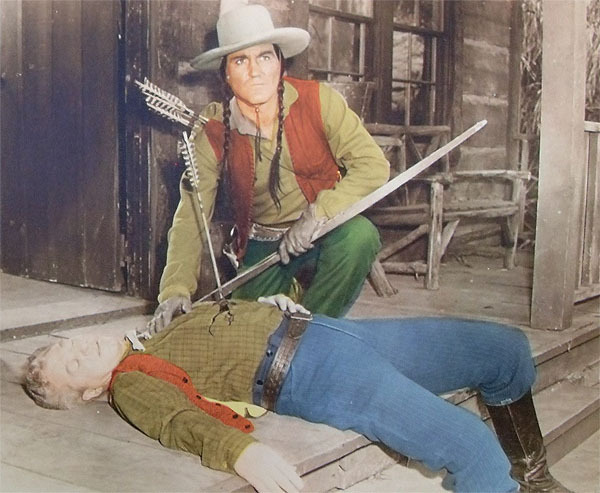 Above: Lane Bradford has committed a murder that will be pinned on innocent Indians, in a scene that was cut from the finished version of Man with the Steel Whip (Republic, 1954). His victim is Robert Carson. 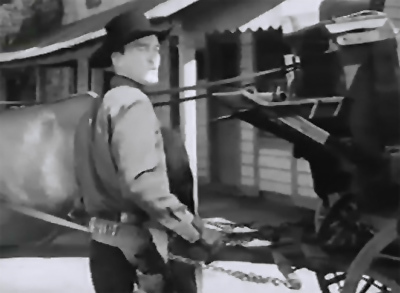 After Man with the Steel Whip, Bradford would work only occasionally in theatrical films. However, his extensive television career was just beginning. Over the next nineteen years, he made multiple appearances on virtually every major Western show—first on B-western-derived series like The Cisco Kid and The Gene Autry Show, then on the “adult western” shows which succeeded the B-western ones (Gunsmoke, Rawhide, Bonanza, Have Gun Will Travel, and many others). He almost invariably played heavies, and quite frequently landed major roles; his coldly nasty screen persona was admirably suited to the harder-edged villainous characters that populated the TV shows of the late 1950s and the early 1960s . Bradford also worked on non-Western series like Batman and Dragnet, doing so more frequently as TV westerns faded in the late 1960s and early 1970s. He moved to Hawaii circa 1970, “commuting” back to Hollywood during the TV filming season. His last screen work was an episode of William Conrad’s private-eye show Cannon, which aired in 1973. Only a few months later, Lane Bradford died of a heart attack in Honolulu. Even though he played subordinate villains for most of his career, Lane Bradford’s bad guys always came off as thinking evildoers instead of dull-witted goons. His evil deeds seemed the result of cool deliberation, not thuggish wrath, and were all the more frightening for it. While Bradford’s later television appearances perhaps gave him wider scope for his brand of screen villainy, his serial performances gave him valuable experience—and were quite memorable in their own right. Above: Lane Bradford with Roy Barcroft in The James Brothers of Missouri (Republic, 1949), which gave Bradford his first major serial role. Acknowledgements: My thanks to Boyd Magers’ Western Clippings page on Lane Bradford for biographical information. Nice job thanks my favorite bad guy!